The majority of international travellers return home safely. Some are not so lucky. I share a real life situation in which my close friend's wife died while on a recent vacation. Based on his personal experience there is a document he wishes he and his wife had each brought on their international trip. You may wish to check your federal government's website to see if guidance is provided on what to do if there is a death abroad. I have learned many years ago the importance of having a readily accessible current Will and Power of Attorney when travelling abroad. Never, however, has anyone ever suggested I should have a readily accessible copy of our marriage licence! Although an overwhelming majority of travelers return home safely following their international travels, some are not so lucky! I have been unable to locate comprehensive current data of civilian deaths abroad other than a Bloomberg article from July 2015. My understanding, however, is that hundreds of US citizens die abroad from unnatural causes on an annual basis. Since the US population is considerably larger than that of the countries in which many readers of this blog reside, I suspect the figures might be lower than that for the US. While the probability of returning home safely following international travel is high, actual events which occurred recently to a close friend of mine has prompted me to write this article. Let me explain why I think it is extremely important you consider bringing a copy of your marriage licence with you when travelling abroad. I also think the importance of this document is even greater if you/your spouse have retained your respective last name following marriage. A few months ago on social media I noticed people were posting messages expressing their condolences for my friend’s wife. I tried reaching my friend on his cell to find out what the heck was going on but my efforts were to no avail. I reached out to a close mutual friend who informed me that while my former roommate from my Calgary days was on vacation in Mexico with his wife and another couple, his wife was struck by a motor vehicle and killed. My friend was tired one day and decided to rest at the hotel while his wife and the other couple went to explore the area. My friend was awakened when the other couple called him late in the afternoon inquiring where they were going to eat that evening. This puzzled my friend given that his wife had been with the other couple all afternoon, the other couple indicated they had been back at their hotel room for over an hour, and my friend’s wife had still not returned to the hotel room. Alarm bells went off in my friend’s head so he went to the hotel’s front desk to inquire whether his wife had checked in. You can guess things weren’t good given that he was instructed to go to the local police station. In addition to a language barrier, my friend’s predicament was complicated by the fact his wife had retained her maiden name. The local Mexican authorities would not permit my friend to view his wife until he could provide evidence they were married. My friend is in Mexico, he does not speak Spanish, he is distraught, and he can’t do anything with the local authorities until he can provide evidence (translated into Spanish) that he and his deceased wife are legally married. OH!... the weekend is fast approaching and the people in Canada who can provide a marriage licence do not work on the weekend. Fortunately my friend was able to reach one of his sons in Canada who jumped through hoops to obtain a copy of the marriage licence. Upon receiving the marriage licence in English my friend then had to have someone in Mexico with a legal background translate the document for the Mexican authorities. I am of the opinion it is important to have a copy of your current Will and Power of Attorney (Health and Wealth) when travelling. Never have I ever thought of also having a readily accessible copy of my marriage licence. I am certainly not an expert in such legal matters but when I see what my friend had to go through I wonder what would be the situation if two or more non-married individuals found themselves in a similar predicament. Would the Mexican authorities have insisted that a family member of the deceased come to Mexico to identify the body and to make arrangements to bring the deceased’s remains home? If so, which family member would be acceptable? What if the family member vouching for the identity of the deceased individual is married and has changed their last name so it is no longer the same as that of the deceased? What if the deceased had no living family members? These events occurred in Mexico. What would be the reaction of local authorities in other countries? I am sure you can think of other questions. Perhaps some travel agents can provide proper guidance but I suspect this would be an exception to the rule given that requirements may differ from country to country. In addition, more and more people are making their own travel arrangements and are cutting out travel agents from the equation. You would be hard pressed to convince me that all the representatives at these online booking platforms would have the correct answers if you were to contact them. 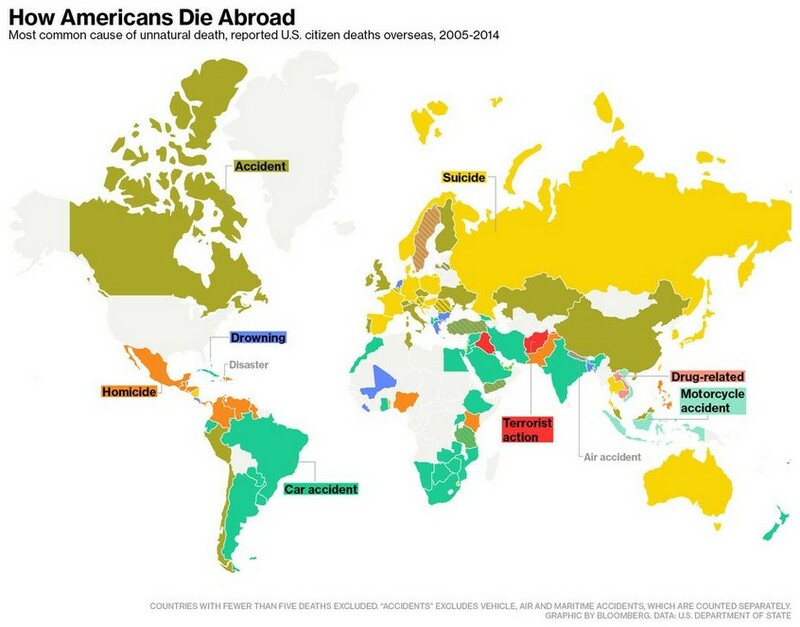 I suspect most countries have a website which provides high level guidance on 'Death Abroad' matters. Since most people who read this blog reside in Canada or the US I provide information for Canadians and Americans which addresses the topic of death abroad. If you reside elsewhere you may wish to check your country's federal government's website to find information on this subject matter. I wish you much success on your journey to financial freedom....and safe travels!